Sunday the 14th of May was the first Pop up Event of the season and we had 10 racing boats, 3 motor boats, 4 cruising boats and 1 Orkney Spinner 13. Everyone met in the club at 11am for a quick briefing on the day. 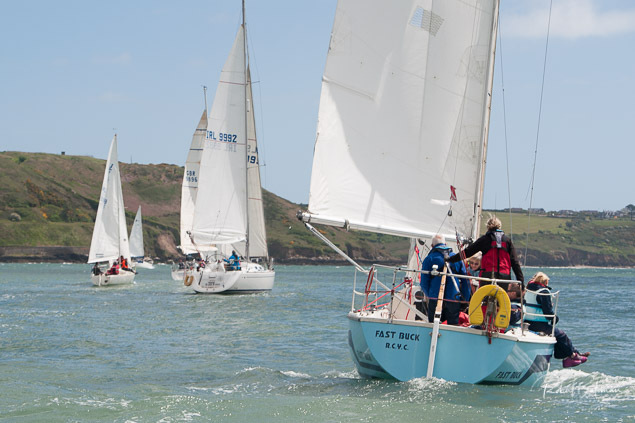 Barry Rose then did a fun informal start for the fleet at 12.30 and we even had one motor boat starting with the sailing fleet see the link to the video below. Unfortunately the weather gods were not on our side for the day and the sea state was not suitable for the fleet to go to Ringabella Beach. The race was shortened at E2 and everyone met up again back at the club for a quick and fun prize giving. The concept which was started by Barry Rose and his committee will continue over the summer and we are really looking forward to the next edition of the Pop up Fun Events. Click here to see the video of the start.